Another Great Trip to Krabi! 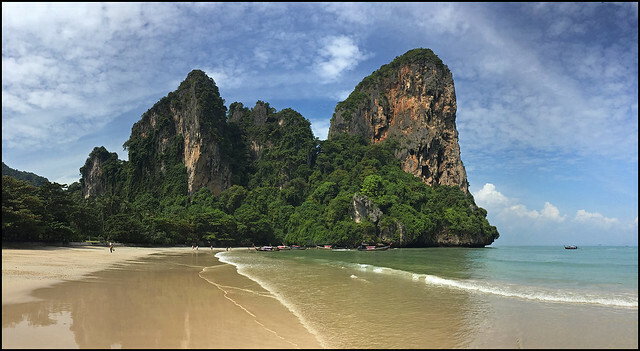 After many years of avoiding Krabi, we made 2 trips in 2017! 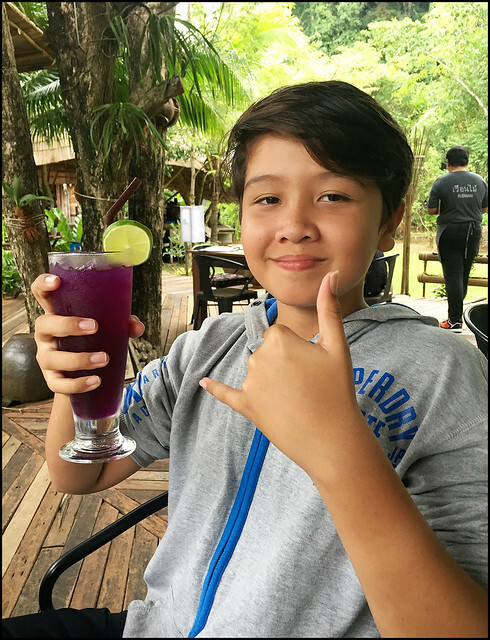 We had 2 nights in April (See : Holiday in Krabi) and we liked it! So we decided another 3 day/2 night trip in July would be a good idea, trying some new places and re-visiting others. And we enjoyed it again, so we're planning yet another trip! 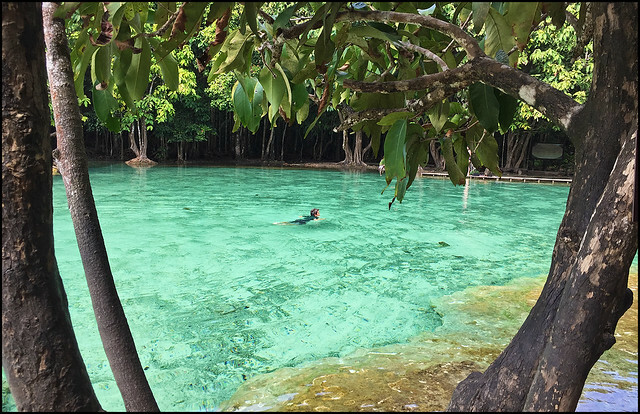 We decided a midweek trip is best, as some of the local attractions like the Emerald Pool get quite busy with locals at the weekend, so we drove from Phuket to Krabi on a Monday. From our house it's about 2 ½ hours, but we took a little detour via Phang Nga, as I'd read about a viewpoint north of Phang Nga Town .. This turned out to be nothing special really, but even with the detour and lunch on the way we still arrived in Krabi Town by 1pm. The hotel we'd stayed in last time (Just Fine Hotel) was actually fully booked, quite a surprise! 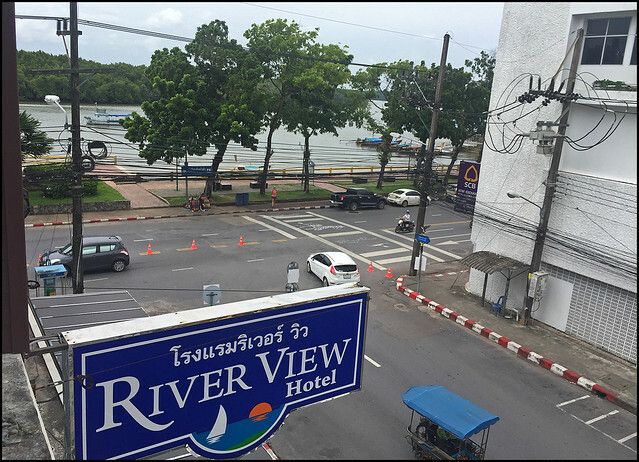 So we booked a place just over the street called River View Hotel, 1000 Baht per room per night including breakfast. And we did have a river view (out of the side window)! 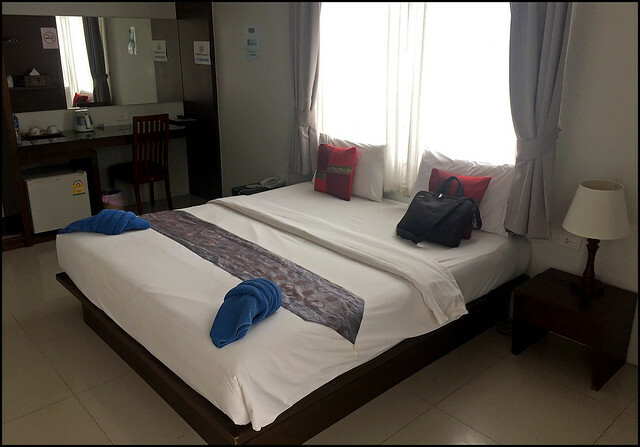 (above) Krabi River View Hotel can be booked online here. There are some slightly more expensive rooms facing the river. Our room was decent enough and we got eggs, toast and bacon for breakfast :) The first afternoon we had no real plan, just relax and wander around Krabi Town, along the river. It's really quite pleasant, although it does lack the old town style of Phuket Town. But it has the river to make up for that! By the way, tours to Krabi can be booked with my friends at Easy Day Thailand. 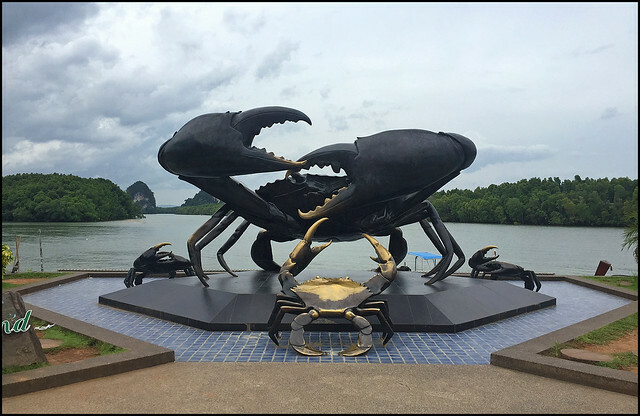 (above) Black Crab statue by the river, Krabi Town. 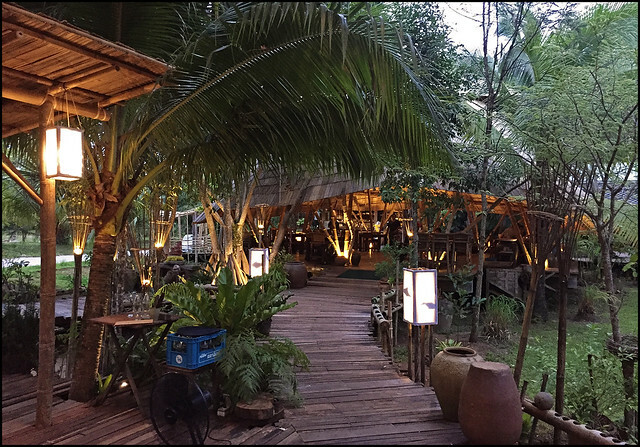 For dinner, I had been given a recommendation by several people for the same restaurant - you must try "Ruen Mai"! It's outside town on the way to Ao Nang and the sign is easy to miss. We got there early, I think it might be best to eat there after dark, as it looked prettier when the lights were turned on just when we were leaving! I could tell from the clientele that this was a restaurant for well-to-do local folk, and the prices confirmed this! 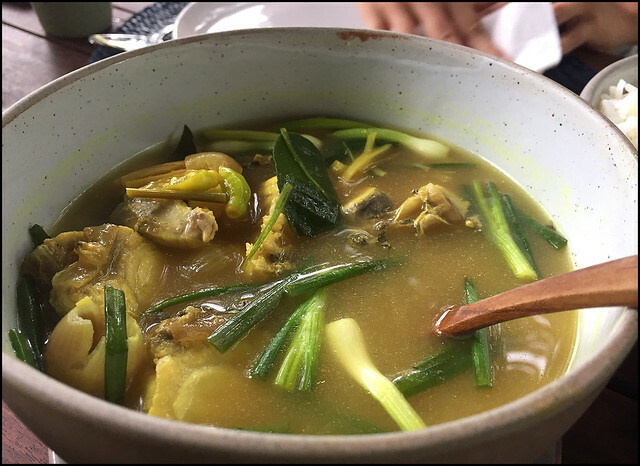 A little bit over our normal budget, all very tasty, but I think we preferred the Anchalee Restaurant that we tried in April. Day 2 ... After breakfast at the River View Hotel, we drove east to the Emerald Pool. We visited here already in April, but it was a Friday afternoon during Thai school holidays and, although very pretty, it was certainly quite busy. So this time we went earlier, arriving there about 9:30am. It actually opens about 8am, and on our NEXT visit we'll go super early! Arriving early means you miss the tour groups who will always be at tourist attractions from about 10:30am - 3:30pm. After paying the entry fee (200 Baht for the dirty foreigner who has lived here 18 years, working, paying tax ... and 20 Baht for Thai people). We took the quicker 800 meter walk to the Emerald Pool this time rather than the scenic 1400 meter route we took last time. Arrived at the beautiful green clear waters .. we were not the very first there, but almost. I counted just 4 other people. Other visitors started to arrive and after about 45 minutes we walked back to the entrance. And I think along that 10-15 minute walk we passed about 100 people heading towards the Emerald Pool. If you want to see a tourist attraction without tourists - get there early, or get there very late when all the tours have gone home! After the Emerald Pool we thought about driving as far as Trang Town, about 100km .. maybe a bit far. Or maybe just back to Krabi Town. 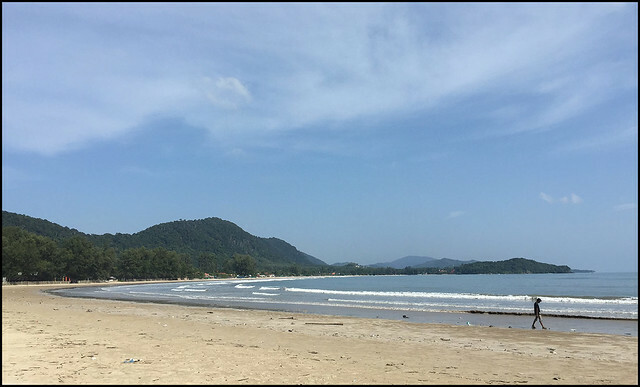 We planned to visit Railay Beach the next morning ... so what to do this afternoon. 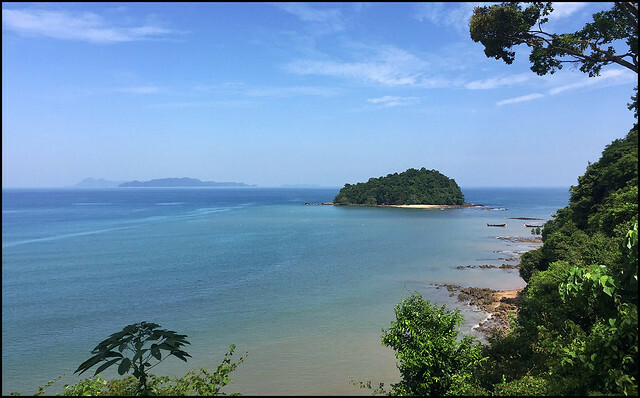 I looked on the map and realised that Koh Lanta was not too far away - only about 50km from the Emerald Pool to reach the ferry over to Koh Lanta Noi island, which is then connected by a bridge to Koh Lanta Yai. 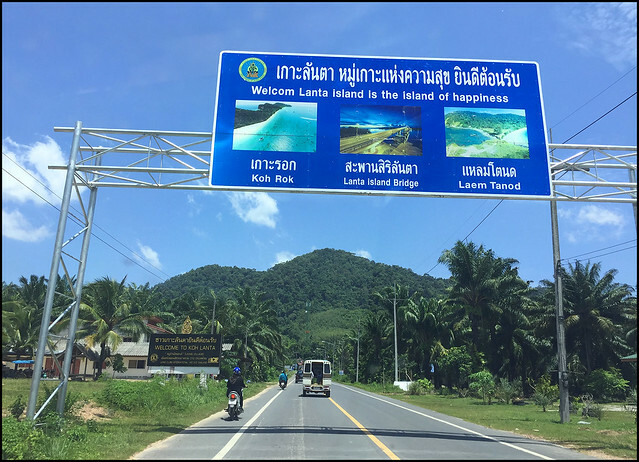 I have wanted to check out Koh Lanta for a long time, so we took a drive with the idea of taking a quick look at Lanta and (if we liked it) planning a longer trip later. I always thought Koh Lanta was a long way to drive from Phuket, but I think we could reach the ferry in about 3 hours. Or of course you can get a ferry from Phuket! 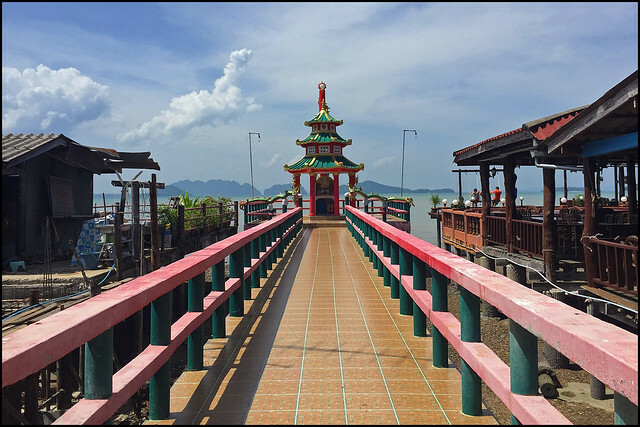 We got to the Lanta ferry by about 12:30, only a short 10 minute wait, drive on to the ferry, it's inexpensive, and the ferry takes about 20 minutes over to Lanta Noi island, which you drive across in a few minutes, then over the bridge to Lanta Yai. I have read that in peak season, at peak times, there can be a big queue for the ferry. 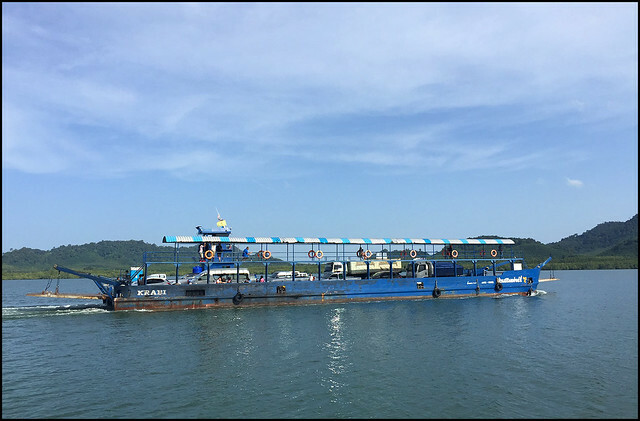 (above) Car ferry to Koh Lanta .. Welcome to Lanta Island .. Island of Happiness, they say! We only had a few hours for a quick look around, and I wanted to try the east coast first - not much in the way of beaches, but there is an "Old Town" and the road carries on almost to the southern tip of Koh Lanta, so we headed south .. also, we needed lunch, and we figured the old town would be a good place to try! 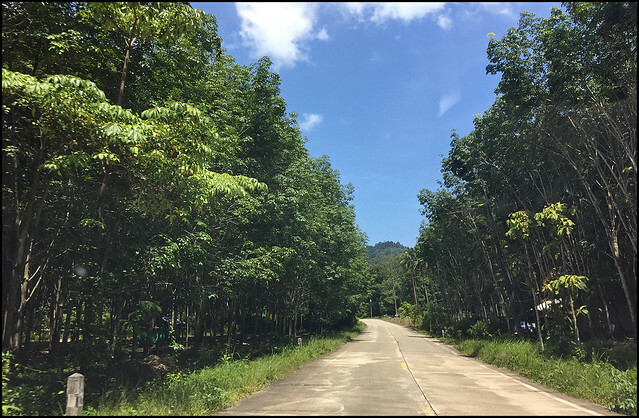 (above) Koh Lanta Road to the old town. Much of the 25 minute drive looked like this. Very quiet. Very little traffic. A few tourists on mopeds. 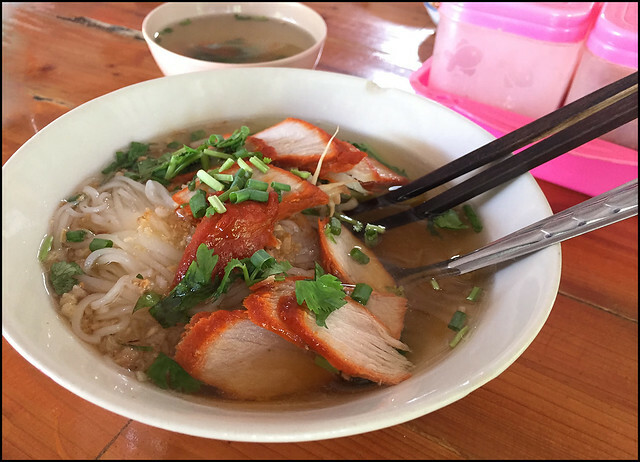 Right as we hit old town, we saw a promising looking old noodle shop, and they also had "Khao Ka Moo" (rice with steamed pork leg). Big portions and tasty. (above) A simple lunch in Koh Lanta Old Town. There did not really seem to be much to the old town, quite a few souvenir shops, but no tourists, a few small restaurants, a few actual houses and a Chinese shrine. My daughter and I took a walk along the street. Wife and son were lazier and drove a few hundred meters to meet us! We followed the east coast road as far south as possible with some very nice views, then double back past town, to where a road heads over the hills to the west coast. The hills in Koh Lanta are quite high, up to about 400m above sea level. If there are any hiking trails, I bet there would be some amazing views. Now the west coast turned out to be a bit disappointing. The beaches we saw very very dirty. I know it's low season, I know the wind blows trash onto the western shore, but it seemed like no effort had been made to clean up. 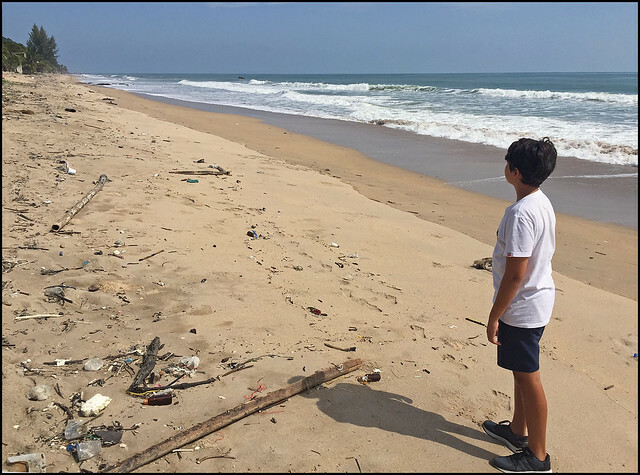 And it was also very difficult to get to, or even see the beach, as all beachfront land was occupied by businesses, hotels, restaurants. The whole place seemed rather neglected. Has to be better in high season and, I don't know, maybe we'll try again when the winds blow the other way. We spent about an hour driving up the west coast with a few stops. Then a quick drive back to the ferry and about 1 hour drive back to Krabi Town. And rather than a "nice" restaurant we walked around town and found some very tasty chicken noodles for dinner. 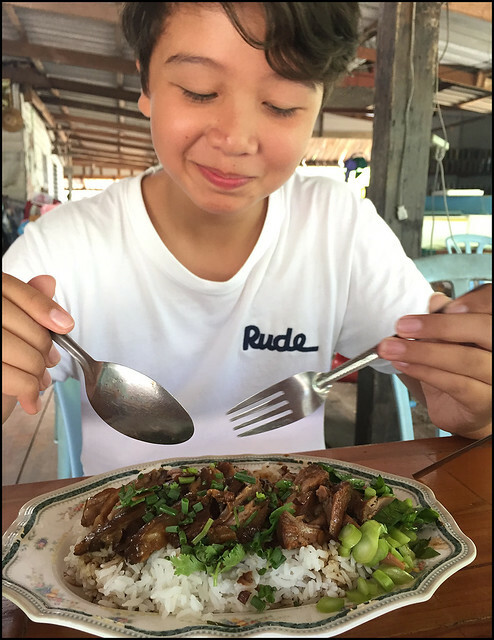 Always happy when we can get tasty, cheap street food and the dinner bill is less than 200 Baht for the family! Day 3 ... And we did a lot before heading home to Phuket! 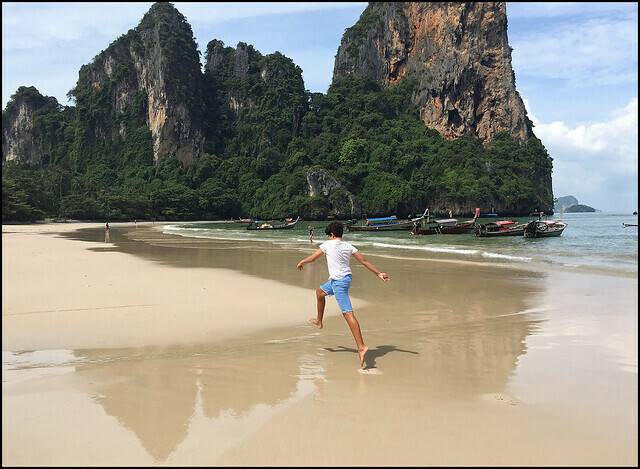 I really wanted to visit Railay Beach. In all these years I have never been there. My wife was not too bothered. Just another beach? Well, I can say we really liked it and if we're planning yet another Krabi trip, Railay is on the list again. From where we stayed in Krabi Town at River View Hotel, we had to walk just a couple of minutes to get a longtail boat from the river to Railay Bay. Price each way 150 Baht per person. (above) Longtail boats by the river in Krabi Town. The trip to Railay took about 30 minutes in calm seas. Boats arrive at a large floating pier which is at Railay Bay East - not much of a beach here, more mangroves. 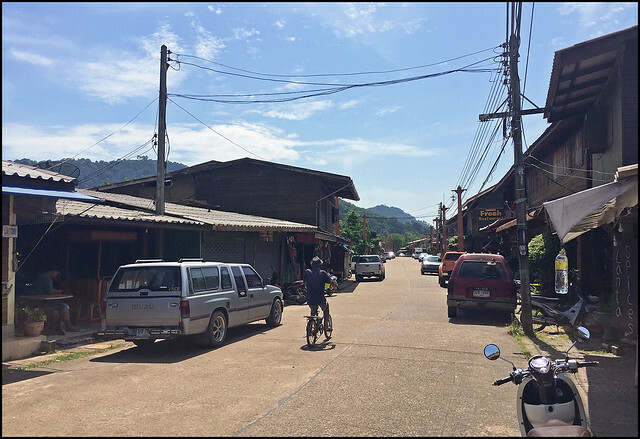 To reach West Railay it was a few minutes walk down a narrow alley, a gap between hotels, a bit smelly in places. We bought water in a minimart - everything double the normal price because everything here has to be brought in by longtail boat. Small bottles of water - 20 Baht. 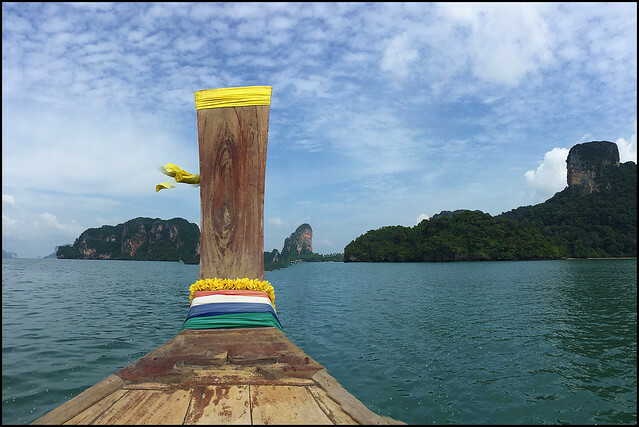 I took a LOT of photos this day, and I have written a separate blog post about Railay and Phranang Beaches. 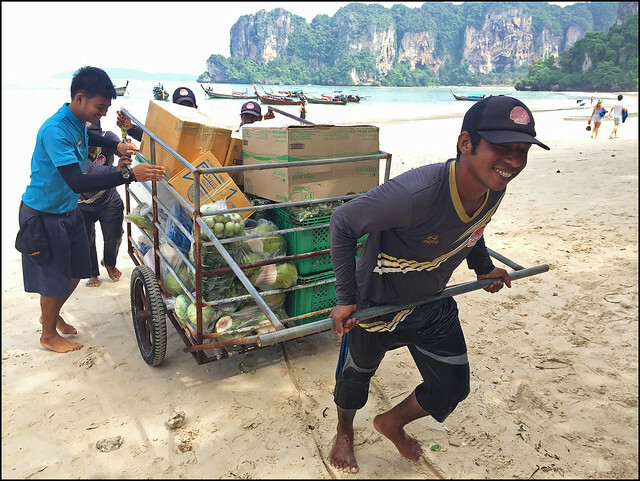 As soon as we got to Railay Beach, we were confronted with a spectacular view and lots of people unloading supplies by hand from longtail boats. Plenty of work goes into that 20 Baht bottle of water! (above) Raily Beach (West). It gets lots of hype, so I was expecting something less, but it really is gorgeous. My boy just had to run around in joy :) Now, we got there fairly early, about 10am. I have heard that it's busier in the early afternoon as lots of people arrive from Ao Nang, more from Krabi Town, some from Phi Phi too. Just like the Emerald Pool, getting there before the crowds is a big help! There are of course hotels at Railay Beach - have a look at Agoda. We might look into staying there next time. We had limited time, and had only planned a quick look around before heading back to town and checking out of the hotel, but this really is a beautiful place. Another trip is needed! From West Railay, we walked back to East Railay and then took another pathway heading to Phranang Beach. This path winds around caves and stalactites for a couple of hundred meters, arriving at Phranang Bay which is truly wondrous .. and already quite busy when we got there at about 11am. Phranang is a place we could stay for a while, bring some drinks and snacks, take a swim ... next time. There are a couple of points of interest here. I know there is a viewpoint that needs a bit of climbing to reach. We did not have time for that. 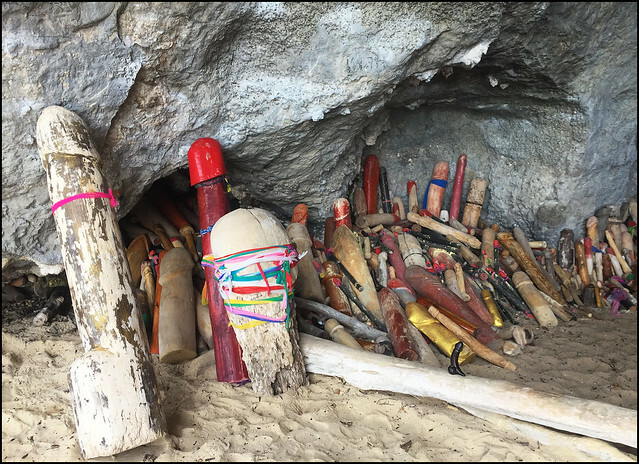 But right there on the beach is a cave featuring an unusual shrine to the princess of Phranang cave. Offerings are made here in the form of lingams ... phallic symbols resembling the male organ. 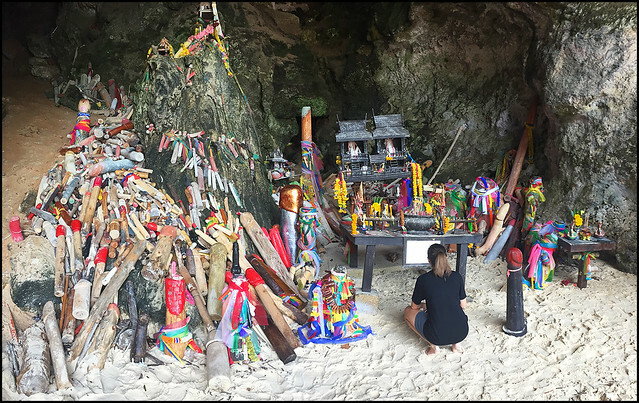 This is said to bring luck, prosperity and fertility to the local people. 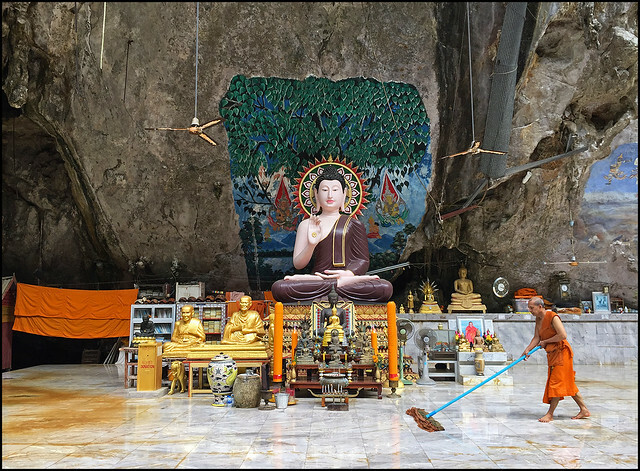 Phranang is also well known for rock climbing. 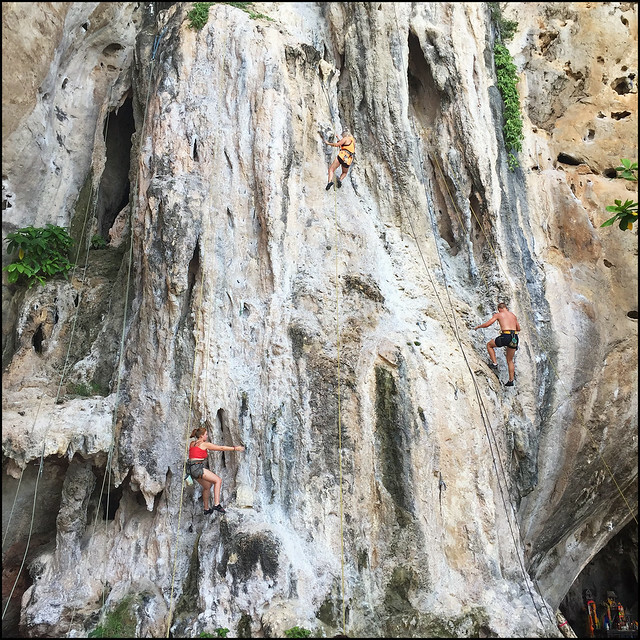 Krabi is the place to be if you want to learn/try climbing, or if you are an experienced climber. Just along the beach from the cave we found many climbers and ropes. 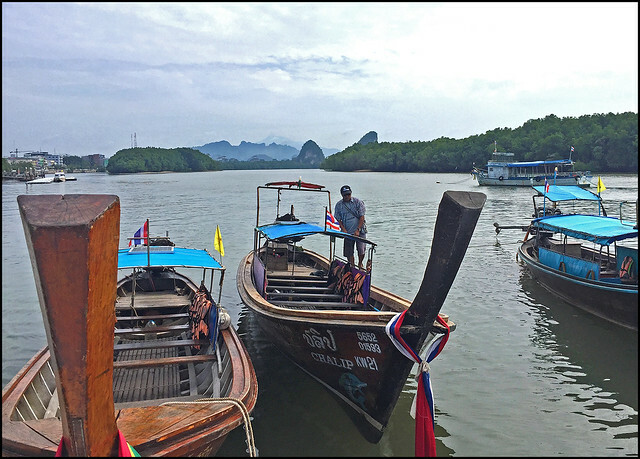 Our longtail boat was waiting at East Railay and we headed back to Krabi Town at midday, checked out of the hotel and thought about driving back home to Phuket. But first .. 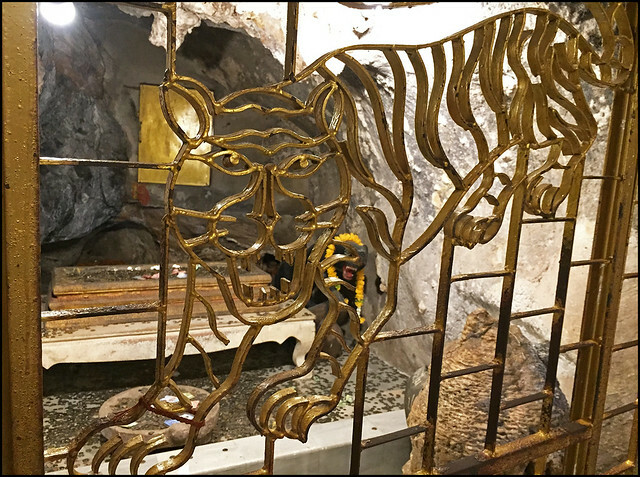 I wanted to visit the Tiger Cave Temple again. Last time we hiked up the 1,237 steep steps to the top of the temple, amazing view from there. But I realised that we had not actually seen the cave after which the temple is named. Apparently tigers used to hang out around here and locals would hear them. 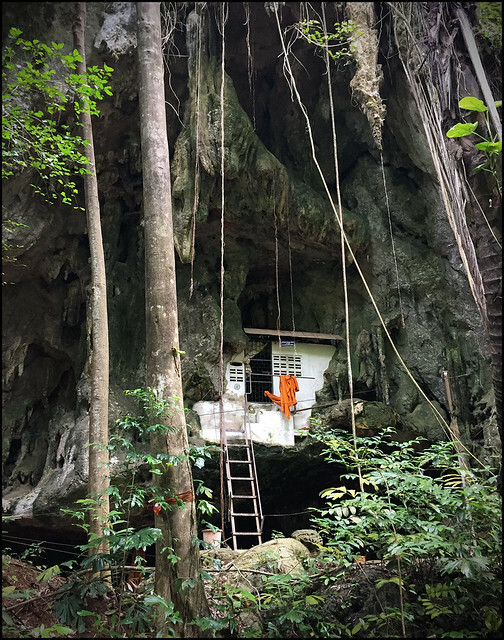 But according to what we read, some Monks went to live in the cave in 1975 and since then no tigers have been seen. I don't think there are any wild tigers around these days. The last wild tiger caught in Phuket was back in the 1960s. And then, right at the far end of the temple, we decided to have a look at a big statue of Guan Im, the Chinese goddess of compassion .. and past her was a steep stairway with a sign saying "Wonderland". Say what? Wonderland? Did we want to hike up? Well, OK .. about 100 steps up, enough to get sweaty in the middle of the day. And then .. steps going back down the other side into the jungle. With caves. 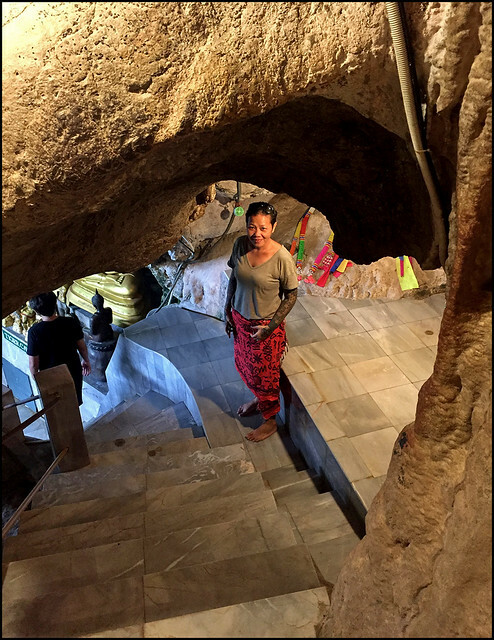 There's a pathway which loops around passing 4 or 5 different caves, plus this is where some of the monks live. 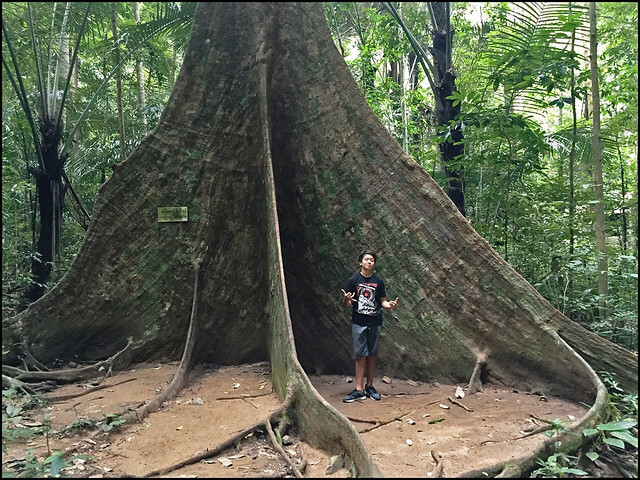 (above) And we were also very impressed by giant jungle trees with the biggest buttress roots I have ever seen! So, yes it was worth getting achy legs going up and down the steps to this area! 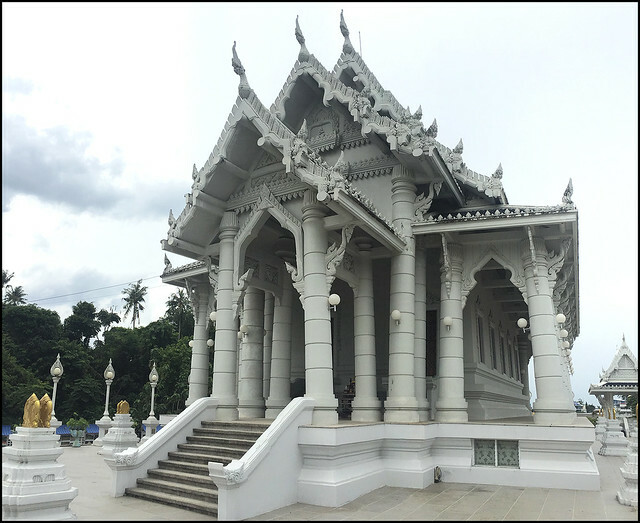 We did not leave Krabi until after 4pm, making it a full day and a full 3 day trip. But now we've done a couple of these trips, Krabi seems much closer to us in Phuket. The drive is not too long - maybe a bit far for a day trip, but a weekend trip, just 1 night would certainly be possible. Not sure when the next trip will be, but soon. 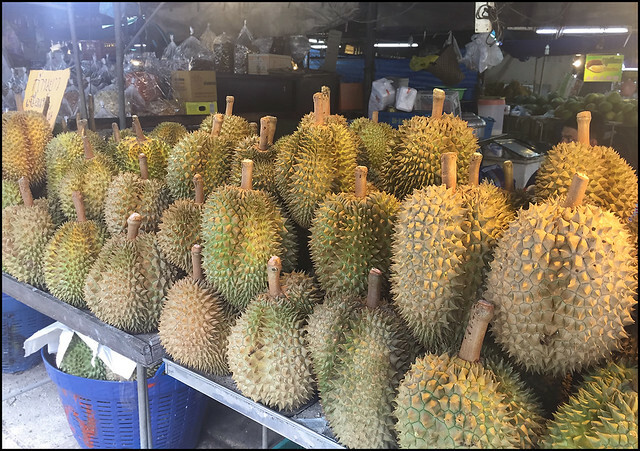 You have been reading ... Another Great Trip to Krabi!